I am more of a glitz and glamour kind of girl…I mean boy. While Neely is more of a leather and lace, ride or die kind of girl. I like to say my spirit animal is a cross between Betsy Johnson and a unicorn, while Neely’s would be more of a cross between Ke$ha and a black panther. Neither of us mince our words or have what all you “normal,” well-adjusted people call filters, but I do my damage with a sweet smile then send you a muffin basket, while Neely just offers you a band aid if you’re lucky. Our life goals have often been the same, but our journeys have always been very different. I encouraged her to marry for money and she didn’t. She encouraged me to buy her a new BMW and I didn’t. Our paradoxical personalities have given our family a menagerie of memories that we revisit every time we are together. We can sit for hours laughing at the same story we laughed at the last time we saw each other. The best part is we don’t need an audience, we are as entertaining to ourselves as we are to the rest of the world. It is definitely a match made in opposite heaven and even though we are different, we complement each other perfectly to be as entertaining and impressive as if we were standing alone. The art world embraces opposites in ways that no other subculture does. We celebrate the dark alongside the light, and relish when some urban artist decides to add a sweet, little butterfly to his staggeringly intense, political messages. When an artist does this, we foolishly call it irony and we pat ourselves on the back for having “art appreciation.” Opposites really do attract, and they attract in ways we don’t even notice. Breaking away from what some critics called a “niche,” David Harouni has created a style and a look on linen that is bringing a new attitude to an already artistically-anointed concept. On linen, we see a departure from the golden crowns and signature red-lip smears that we have come to expect from his iconic creations. David brings such great texture and deep emotion to his labyrinthine process that the textures are able to gather light and reflect it onto other sections of the painting. The texture is a symphony and lights its masterpiece. Holding real-estate on the walls of the most stylish people in New Orleans and beyond it is easy to see how one might consider Harouni having found or created a “niche.” I disagree. An artist of this magnitude’s caliber could never fit into a “niche”. What Harouni has done in his career, is enchant and challenge us to look deep into ourselves as he layers medium and erases medium until the final fabrication is complete and unabbreviated. He isn’t marking a niche so much as making a canyon of emotions that offers us a journey into the mind of an artist who I consider to be a genius. Harouni’s layers don’t just come from a love of texture and a competent artistic skill, they are part of the artist. His soul, his journeys, his beginnings, his endings - they are all laid out before us. A visit to his gallery at 933 Royal Street will have you enchanted. The works hang in very much the same manner that it’s created. 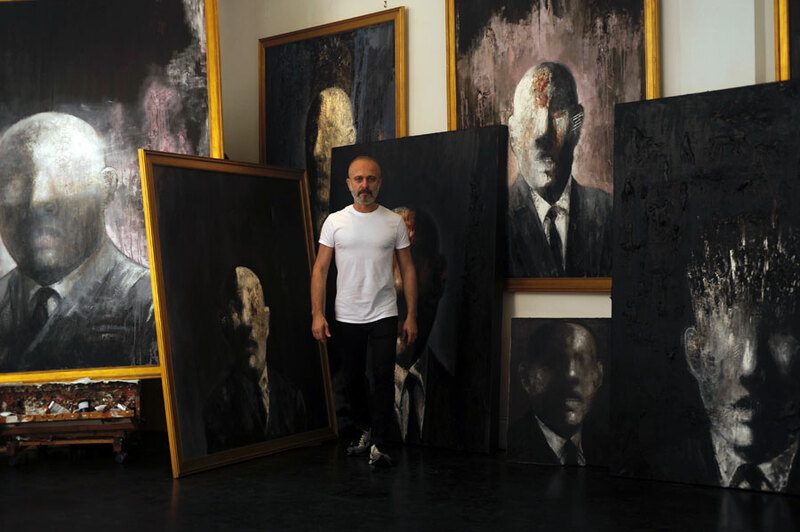 Glance across the gallery and you are in the midst of layers of Harouni’s work. A visual wonderland presented layer by layer. Gallery Arlo, at 837 Chartres Street, represents a New Orleans artist who takes symbolism and figurative studies a step further than we’re used to seeing in collage work. Stephanie Akers creates images of the female form in a way that transcends the typical portraiture that we have come to understand. In spite of the very Frida Kahlo feel to her Bullseye Series, Akers is heavily influenced by vintage photography from the turn of the 19th century, and uses photographs of her own painted portraits in the finished work. While her piece “Girl with Big Crown” celebrates the noble nature of being a woman, it’s the depth of texture that’s a rarity in the collage world coupled with her message so deeply embedded in the work that the images and imagery hit you long after you have viewed this work and the collection. While some artists challenge us to contemplate our personal pilgrimages, other artists allow us to find simple humor and comfort at the surface of this world we live in. One such artist is Reid, also at Gallery Arlo. Reid paints trees that are loaded with imagery representing his journeys, hopes, aspirations, as well as his past. However impressive these messages may be, the important part of Reid’s work is that it is easy to see, easy to read, and easy to understand. The staggering part is that Reid relays beauty and hope for mankind in paintings that do not depict human beings. 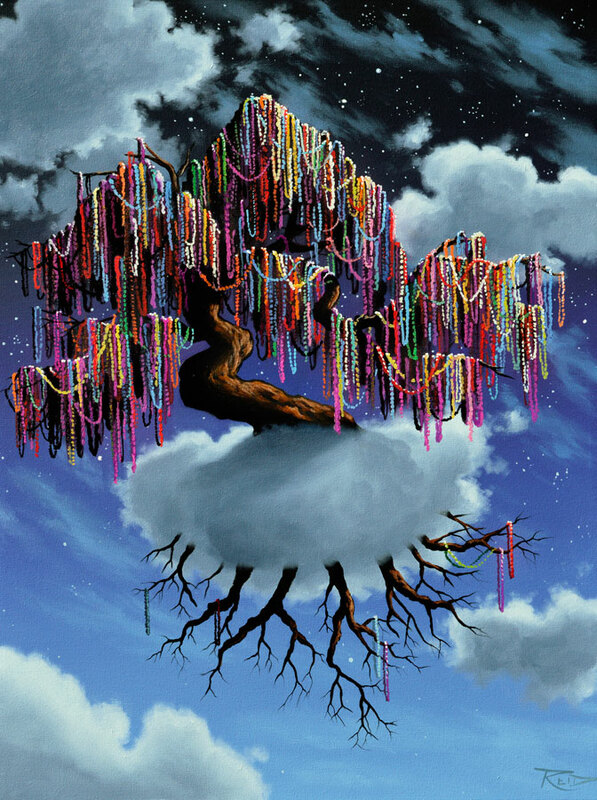 Arguably his most notable New Orleans work is “A Night for Revelry” in which the artist depicts a hearty and powerful tree covered in Mardi Gras beads. It’s a sight so many of us New Orleanians consider common, but a breathtaking delight to those who don’t see such on a nearly daily basis. “A Night for Revelry” will be offered as prints on canvas available at Gallery Arlo in celebration of New Orleans’ Tricentennial. A visit to Gallery Rinard at 611 Royal Street is the kind of visit loaded with everyday images, celebrated in new and fun ways. With works by its namesake artist, Matt Rinard, this gallery beams with color and humor. Serving up the world on a menu of elation with fun as the daily special. 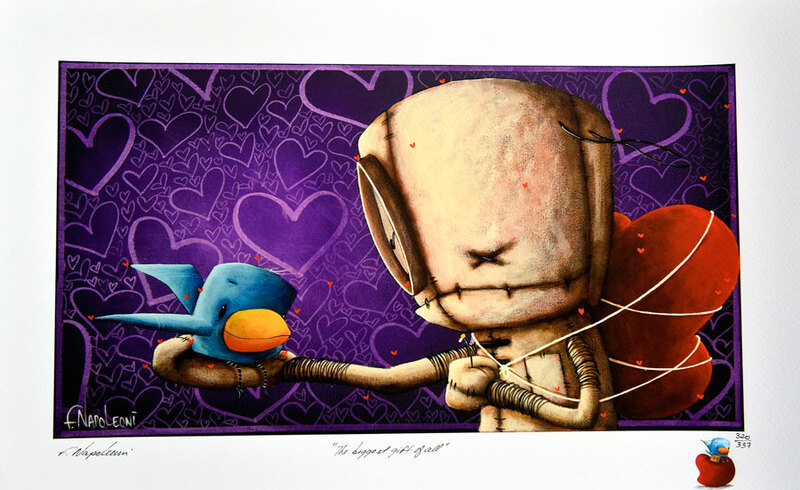 Artist Fabio Napoleoni generates moving images with concrete symbolism that is obvious in nearly every piece he creates. Trees and hearts are a trademark in his sensibility-driven creations. This artist not only obviously incorporates his personal feelings into his art, but allows the viewer to experience his emotions with the perfect amount of commitment. We see that art, we feel emotion, we move on to the next piece. This is not to say that Napoleoni’s work isn’t riveting enough to hold your attention, it’s quite the opposite. You want more from each piece and realize that each piece depends on the others to punctuate its differences and strong points. Artist James Dean, a.k.a. 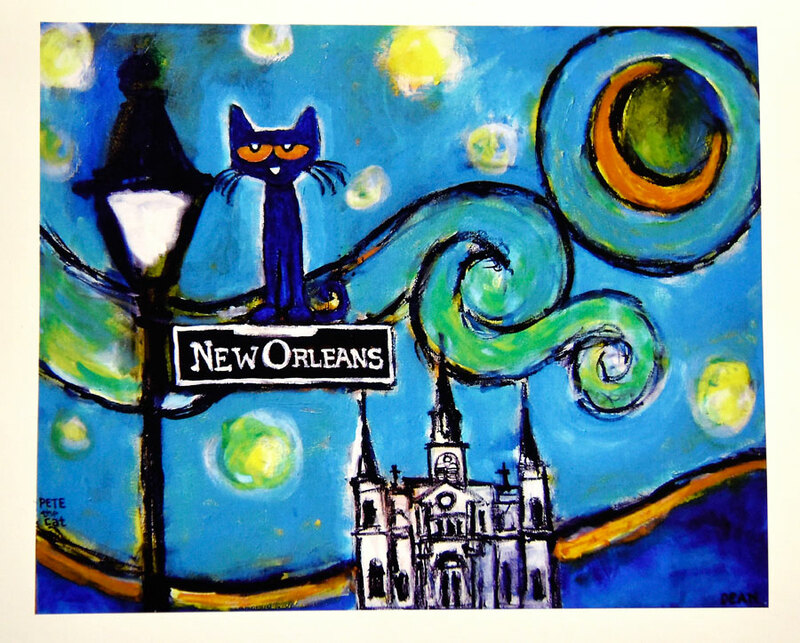 Pete the Cat, is another Gallery Rinard artist who is giving us a run for our emotional money, that is if laughter were dollar bills. 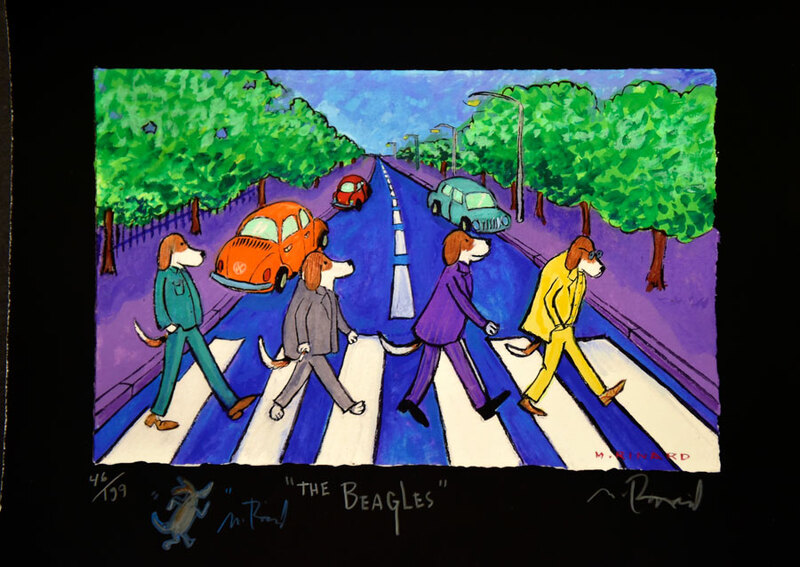 Turning his delightful main character into as big an icon as that indigo dog we all know and love, Alabama-based Dean creates art that is a far departure from deep thought. However, we do laugh out loud at some of the visual antics he manages to heap onto this delectable little black cat named Pete. From drinking coffee in a mug marked “cat,” to swinging from the wrought iron balconies of the French Quarter, Pete catches you off guard and makes you appreciate what good comedic illustration really is. Gallery namesake and staple artist Matt Rinard has become known for his tongue-in-cheek approach to all aspects of life depicted through animals, primarily dogs. Rinard pokes fun at politics, pop culture, and anything that will stand still long enough for him to take notice. His visual messages are supported by an extremely clever play on words. Take his “My Cat Has Nine Knives” piece: a tabby in a chef’s hat is reaching for a wooden block of knives as panicked pooches look on. Rinard’s name has become synonymous with the canine loving Mardi Gras Krewe of Barkus. This year, he once again provides the krewe’s poster. Designing the poster with a twist on the HBO series phenom, Game of Thrones. His version, “Game Of Bones,” places pets in the title roles from the series and puts an amazing spin on something most of us might consider ubiquitous. In fact, that is Rinard’s torch song: taking what we see right in front of us and making it funny, making us laugh, or introducing us to his cusp-hanging, dark side. My personal favorite, “It’s Such A Perfect Day, I’m Glad I Spent It With You,” depicts a dog and a cat arm in arm under a tree as the sun sets. Two totally opposite beings come together in the end to show that even when we are different, we are still very much alike. Today, our busy lives and living in different cities, limits the amount of time I get to see my sister. Neely teaches visually impaired children how to integrate, adapt, and live day-to-day lives in this busy, fast-paced world. She focuses on their independence and making them accountable for themselves, even with their disability. She once told me her students aren’t disabled, they are just differently-abled. When you think about life in that manner, we aren’t all that different after all.